Staying in ketosis is an important part of the ketogenic diet. After all, ketosis is the metabolic state in which you burn the most fat and keep it off, among many other health benefits. If you’re new to the diet, or even if you’ve been doing it for a while, it can be hard to know whether or not you’re truly in ketosis. There are some signs of ketosis. However, it’s important to find a reliable way to measure your ketone levels. 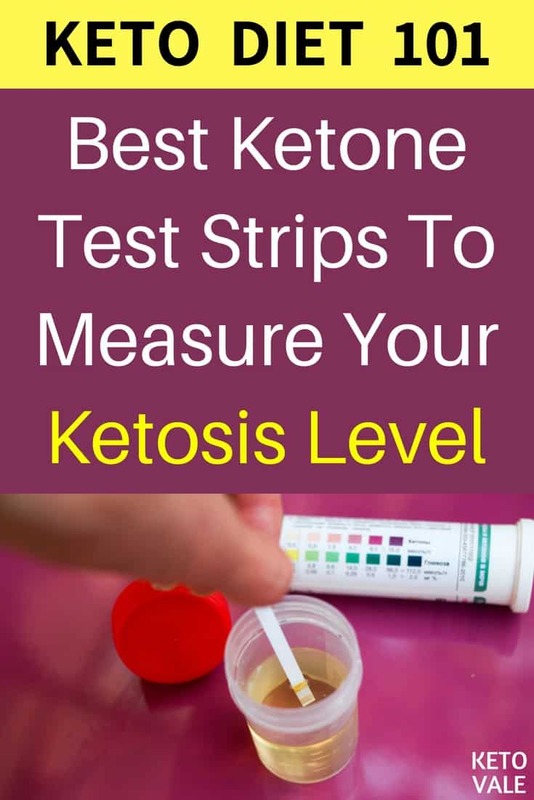 This article discusses how to test ketone levels and reviews the best ketone test strips out there so you can stay in fat-burning mode for as long as possible. There are 3 primary ways to test your ketone levels: by testing your blood, urine, or breath. You’ll get the most accurate readings from a blood test, but many people use breathalyzers or urine strips because they are cheaper and don’t involve needles. 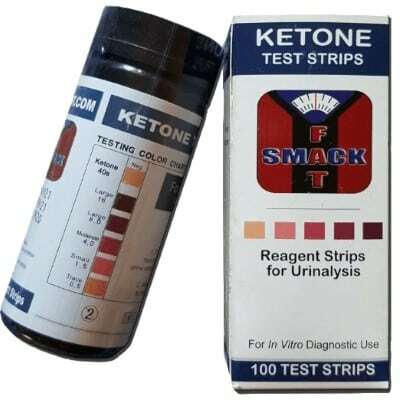 If you’re looking for the best way to test your ketone levels without carrying around a handheld breathalyzer device, then we recommend using urine or blood strips. They fit right in your purse or gym bag, and you can use them to test your ketone levels multiple times a day. If convenience is your thing, then we recommend going with urine strips. They work by measuring the levels of acetoacetate in your urine. This is an unused ketone body that is excreted in your urine when your ketone levels are high. Unlike glucose, excess ketones are excreted in the urine instead of being stored in your fatty tissues. This is one of the many reasons why the ketogenic diet is so effective at helping you lose weight. Things get a little more complicated when using blood strips. This is because, in addition to buying blood strips, you also need to purchase a compatible blood reading meter. Blood strips work by measuring the amount of beta-hydroxybutyrate or BHB ketones in the body, which is one of the main types of ketones used for energy. You can either pee in a cup then dip the strip in it or pee directly on a strip. After waiting for a few seconds (depending on the product you use), you can compare your result with the colour guide on the bottle to see where your ketone level is at. Note: Any color above negative means ketosis. Darker or lighter doesn’t matter that much as long as you’re in ketosis. Don’t stress over the numbers. 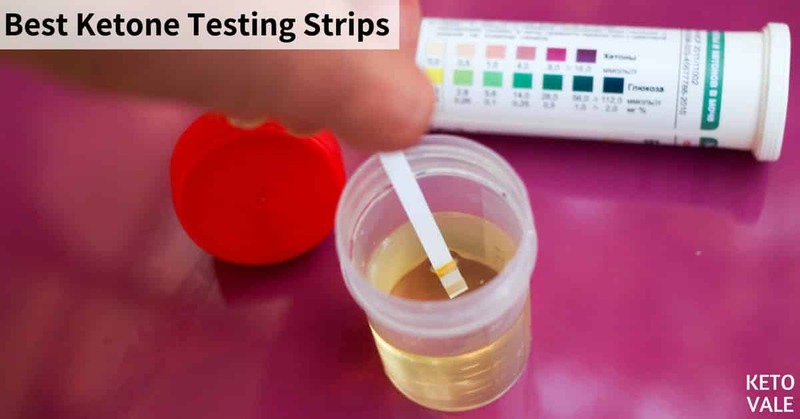 Below, we’ve reviewed the best urine and blood ketone strips to help you make an informed decision and stay on top of your keto game. 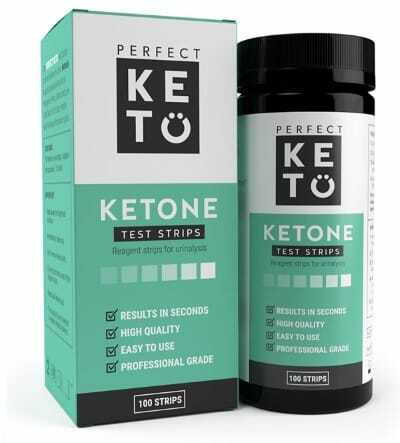 These Perfect Keto Urine Strips offer several key features. First, they are professional grade yet they are easy to use and read. Results show up in 40 seconds, so you won’t have to wait around to see where your ketone levels are at. You get 100 urine strips for under eight dollars, which is a great value. If you’re curious, especially in the beginning, you might want to test several times a day to see how certain foods affect your ketosis, it’s important to invest in a stash of urine strips. Plus, there is a color guide printed on the side of the bottle so you can easily hold up your strip and measure your ketones right away. It’s hard to say anything bad about these strips! They are high quality and easy to travel with. The results take a little longer than a blood meter and they won’t be as accurate, but then again, these strips don’t require you to prick yourself with a needle. 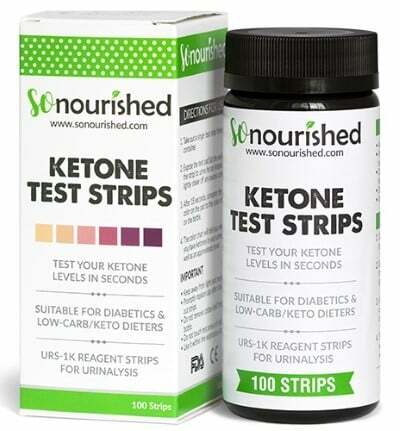 So Nourished offers a brand of urine keto strips, and we are so here for it. These strips are great for keto dieters and diabetics alike. Results show up in 15 seconds, which is much quicker than the first product. You’ll get 100 strips per bottle, which is good because like we said above, you’ll be testing a lot, so you want to have a lot of strips available at all times. Keep them in your gym bag, desk or car, and make sure to keep a few in the bathroom, too. As with the first product, there is a color guide listed on the side of the bottle so you can easily read your results. Just remember to bring the color guide with you when you go to the bathroom! It’s hard to say anything bad about these test strips! They have everything you need, including faster than normal results. They are a little more expensive than the first brand, but not by much. You’ll want to make sure you bring the bottle with you in the bathroom as the color guide is listed on the side so you can measure your results on the spot. If you forget, you might have to carry a used strip out of the bathroom, and no one wants to see that. First, Smackfat is the best name we’ve ever seen on a urine strip, so this product automatically gets points for that. They are reasonably priced for 100 strips, and come with a color guide on the side of the bottle (just like the other two products). Plus, these strips have a lifetime warranty, so you can return them anytime you’re not happy. They’re really easy to use. You just dip the stick in your urine and read after 40 seconds. You can buy these off Amazon or find them at Walmart. Although the product doesn’t say how fast the results are available, we doubt it takes longer than a minute or so. Still, it would be nice to know how long you’ll have to wait after using. Now that we’ve told you all about the best urine strips, it’s time to move on to the blood strips. These will give you a much more accurate reading than urine strips will, but keep in mind that you’ll need to buy a compatible meter along with the strips. For example, if you buy the Precision Xtra strips that we mention in the number one spot, then you’ll also need to buy the Precision Xtra meter. You can learn more about which blood reading meter to buy in our article Best Ketone Meters Review. Precision Xtra is a well-known brand among keto followers, and we like it because of its high-quality products and accuracy. These blood strips are top of the line, just like the blood meter that this company offers. Keep in mind that these strips are pricey, but again, you are paying for accuracy. You’ll get 30 strips that are sold on Amazon, but make sure you also purchase the Abbott Precision Xtra Blood Glucose and Ketone Monitoring System when using these strips. Remember that you need to buy the Precision Xtra Blood Glucose and Ketone Monitoring System along with these strips. This can be expensive, but well worth the investment if you’re serious about staying in ketosis. These Keto Mojo strips are tested for accuracy by the FDA and EU, which means that they meet the strictest standards. The company also claims that they are tested by doctors, trainers, and researchers, so you get the feeling that this is a very high-quality product. We like this company because they offer a lot of handy tools on their website, such as customer support and YouTube videos explaining how to use their product. Keep in mind that these strips are only compatible with the Keto-Mojo Blood Meter System, so you’ll have to buy that, too. Again, these strips are only compatible with the Keto-Mojo Blood Meter System, so you’ll have to buy that, too. It can be an expensive setup, but well worth the investment if you ask us. Measuring your ketone levels is a good way to make sure you’re staying in ketosis, but which method is best? Using a blood meter is the most accurate way to read your ketone levels, but many people use urine strips because they are cheaper and convenient. Plus, you can test several times a day without feeling like you’re spending a dollar per strip (like you would with a blood strip). In this article, we’ve broken down the pros and cons of several urine and blood strips. The primary difference between the two is accuracy. You’ll want to remember that if you buy blood strips, you’ll also need to buy the compatible meter to go with them. This can be expensive, but consider it an investment for your health. These are great options if you’re trying to monitor your glucose and ketone levels at the same time. We recommend staying on top of your ketosis game with one of these high-quality products! Enjoy this post? Save for later!